Reconnecting marginalized communities through service co-creation. 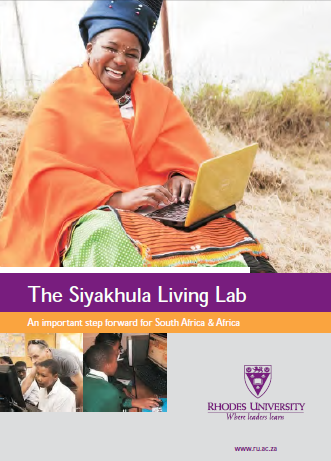 Click here to read more on the Siyakhula Living Lab stakeholder experiences in this recently published 64 page document, courtesy of the Department of Marketing and Communication at Rhodes University. The 2nd Living Lab workshop between South Africa and Tanzania was held on the 17th of March, at Meraka Institute premises in Pretoria. The event was sponsored by the NRF in South Africa and COSTECH in Tanzania. It hosted delegates from our hosts Meraka Institute, the Department of Science and Technology, together with research institutions and living lab managers from both South Africa and Tanzania. The forum was kick-started by a suggestion from the Department of Science and Technology for the delegates to consider discussions on extending living lab partnerships to more African countries. Then, each of the living lab managers had an opportunity to present the business models used within their living labs. These presentations demonstrated the similarities and differences in living labs, the need of technology as an enabler, the vastness of entrepreneurship skills and strength of social media in enhancing activities. After the presentations the delegates had the opportunity to identify the success factors in living labs (considering that every context is unique) together with lessons learnt towards building sustainability. A workshop report document is currently being prepared. 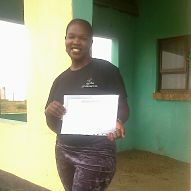 Siyakhula concludes another session of basic computer literacy training in February! From September 2014 to February 2015, Siyakhula Living Lab ran another session of basic computer literacy training in its main field site, in Dwesa. 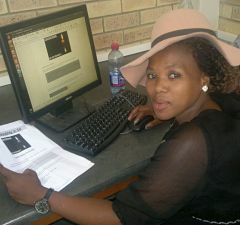 The training was conducted by postgraduate ICT researchers at Rhodes and Fort Hare universities. The session started with about 80 community members and educators from some of the 17 SLL communities in the area with the objective of introducing to them ICT use on communal, shared fixed computer devices, based on beginner content such as Word, Calc, internet and email. While there is a general conception that the presence of mobile devices is large enough to change the direction of ICT in rural areas, our training sessions remind us of the reach of computer use in rural areas to date and the importance of basic computer literacy training . It cannot be stressed enough. For example, during the session we ascertained that more than half the attendees had internet enabled mobile devices and three had computer devices. However, the capabilities of ICTs, especially the internet experience, were new for most attendees who for example did their first Google searches and created of their first email addresses during the session. In the meantime, we are pleased with the progress of some members of the community who have took part in previous computer literacy sessions. More often than not we have received feedback on individuals being employed based on the SLL training. In a few of the cases, community members are now computer trainers to learners in local schools. Read more about Siyakhula concludes another session of basic computer literacy training in February! 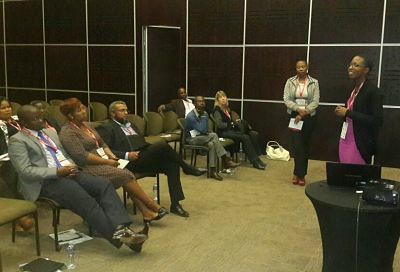 On the 21st of October 2014, four Siyakhula Living Lab researchers and Makana Apps Factory developers joined provincial and national ICT enthusiasts in the 10th annual Eastern Cape ICT summit held at the East London International Conference Centre. The theme of the event was “Technology Breaking Boundaries”. It was attended by dignitaries such as the Honourable Premier of the Eastern Cape province Pumullo Masualle and SITA’s CeO, Mr Freeman Nomvalo. Our contribution was two fold; as exhibitors in the iKamva National e-Skills Institute (iNeSI) and Eastern Cape e-Skills CoLab exhibition stand to demonstrate the pre-versions of the applications Hitch-hike!, MicroTourism, Sell! and HealthMessenger, and also, through a presentation entitled ICT Research, Innovation and Development: An economic opportunity for the Eastern Cape. The EC ICT Summit is designed as a tool for business development oppotunities through matchmaking sessions as well as to create platform to discuss topical ICT issues. 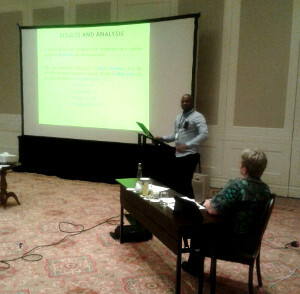 Mr Phumzile Nomnga, a first year Master of Science in Computer Science student attended the 8th International Development Informatics Association (IDIA) Conference held in Port Elizabeth, South Africa, on the 3rd to 4th of November 2014. Mr Nomnga presented a paper on “Evolution of ICT4D for Illiteracy Eradication and Knowledge Dissemination for Rural Community Development” at the conference under the theme “ICTs for Inclusive Communities in Developing Societies”. Mr Nomnga attended the conference and represented His co-authors, Mr Shadreck Mudziwepasi, Mr Mphenduli Ntsizi and Mr Mfundo Shakes Scott. In addition to the presentation he participated in a dialog/debate and attended a workshop on “The Comprehensive Nature of Evaluation in ICT4D Research and Practice”. Also present at the event was Professor Alfredo Terzoli who presented the paper entitled "ICT Skills Training in Marginalised Communities: A Gendered Journey with Lessons or Not?" Miss Pride Nyambi, Mr Munyaradzi Kapfudza and Mr Shadreck Mudziwepasi made the list of delegates for the 2014 IEEE 6th International Conference on Adaptive Science & Technology (ICAST ) conference which was hosted by Covenant University in Ota, Nigeria. The three delegates presented papers on "Persona Mapping for Usability of ICTD Services", "GA optimization of Hybrid Energy Systems for telecommunications in marginalized rural areas", and “Assessment of a Wireless Sensor Network Based Monitoring Tool for Zero Effort Technologies: A Cattle-Health and Movement Monitoring Test Case” respectively. Nyambi emphasized that "Despite the fact that the presentations were conducted virtually through Skype, the setting still enabled engagement with the delegates physically at the conference". The three researchers were in line with the topics of discussion and debate for the conference on satellite communications, Smart Utility Systems, Long Term Evolution networks, mobile technologies and m-health. 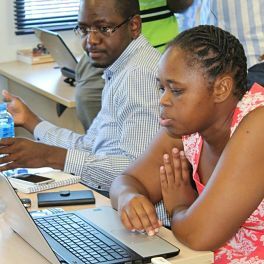 The Makana Apps Factory (MAF) Eastern Cape Developer Group took part in a series of workshops run by the ICT4G group which is a part of the Italian NGO, Fondazione Bruno Kessler, in collaboration with Rhodes University and Fort Hare University. 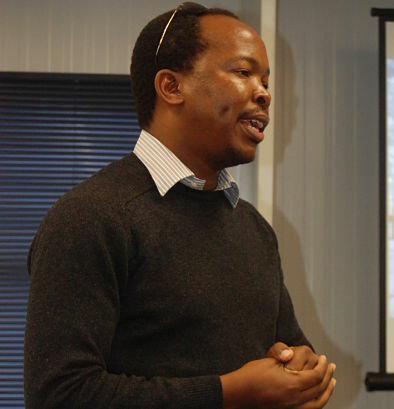 The ICT4G group uses technology to foster economic and social development. These workshops were hosted by a Marie Curie International Research Staff Exchange Scheme Fellowship within the 7th European Community Framework Programme. The four Ruby on Rails Developers Workshops were held in East London, Port Elizabeth and Alice during November 2014. The course focus was on the programming language, Ruby. Ruby helps build web applications very quickly and is used frequently internationally but not within South Africa. Part of the staff exchange fellowship involved members of Fondazione Bruno Kessler coming to South Africa and Sibukele Gumbo from MAF and Siyakhula Living Lab going to Italy. The MAF is the associated app factory for the Eastern Cape e-Skills CoLab: ICT for Rural Development. It is a collaboration between the Eastern Cape e-Skills CoLab and Rhodes University. Ubiquitous broadband as an enabler to transform the lives of ordinary South Africans. In 2014, the Telkom Centre of Excellence (CoE) network’s flagship conference, SATNAC, was brought back to the Eastern Cape province. 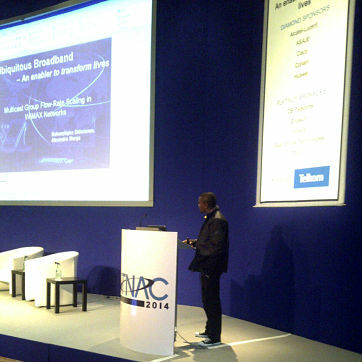 SATNAC 2014 took place at The Boardwalk, in Port Elizabeth, from the 31st of August to the 3rd of September. Its theme, Ubiquitous broadband as an enabler to transform the lives , was relevant towards delivering broadband to all by year 2020. The event’s welcome address was delivered by Rhodes University’s Deputy Vice Chancellor (and former Rhodes University CoE Head), Dr Peter Clayton, while the keynote address by Dr Siyabonga Cwele, Minister of Telecommunications and Postal Services. The main aspects of the SATNAC conference series are the plenary sessions and presentations by the international telecommunications vendor community, and the participation of Masters and PhDs researchers linked to the 16 national CoEs. Of the 91 student oral presentations, 5 were given by Siyakhula Living Lab researchers based at the Rhodes and Fort Hare universities. A further 4 of 30 posters were displayed on the first day of the conference. 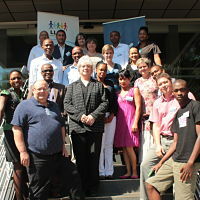 The researchers were accompanied by the Rhodes and Fort Hare CoE Heads, Prof Alfredo Terzoli and Dr Khulumani Sibanda. Read more about Ubiquitous broadband as an enabler to transform the lives of ordinary South Africans. Siyakhula Living Lab on national TV! 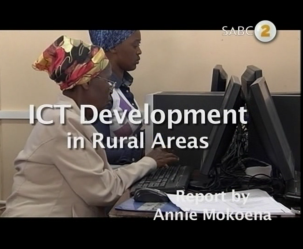 In the month of June, the Siyakhula Living Lab was honoured to be part of the documentary series Leihlo la Sechaba on SABC2 in an episode focussing ICT for rural development. This exciting media coverage, captured, on site, our rural community and researcher perspectives at this present point in time. A shortened version of the episode can be found here. Read more about Siyakhula Living Lab on national TV! A small East London developer community has seen the start of exciting developer activities, thanks to the multi-stakeholder collaboration between the Eastern Cape CoLab, the Makana Apps Factory, WSU, Rhodes University and University of Fort Hare, Eastern Cape IT Initiative and the East London Industrial Development Zone’s Science and Technology Park. As a start, this community were involved in a 20-seat, three part Android Mobile Development workshop series started on the 29th of May, with the second session scheduled for the 25th of July. The facilitator, Prof Mamello Thinyane, presented a much commended, captivating session, assisted by the workshop coordinater Sibukele Gumbo. The workshop series demonstrates the willingness of the SLL team (from Rhodes and Fort Hare) to develop the Eastern Cape community where possible. It also strongly indicates the need for support for the Eastern Cape developer community by provincial organisations. Follow the progress of the workshop series here.